« Formal Wear February – special on fancy dress kitties! 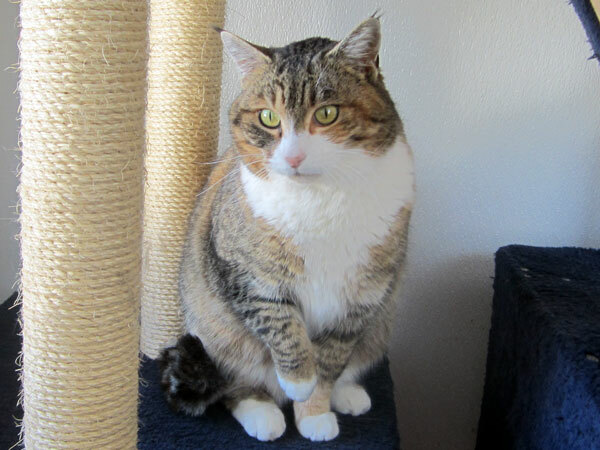 Coquette is a beautiful torbie with white girl, about 2 years old, who arrived as a stray. She has a funny, kinked tail – it bends like it was caught in a door, but it may have been that way since she was born. She is a little bit timid in new situations and meeting new people and cats, but warms up quickly once she gets to know you. She is affectionate, but not pushy about it, and would make a good indoor or indoor/outdoor kitty. We think she would prefer a quiet, relaxed home, and she would be fine as an only cat or with another kitty or two, preferably kitties that won’t bully her but will accept her presence with a friendly attitude. See her full listing here.